Work From Home – in Vermont! Starting 01January, 2019, an important new law came into force. The State of Vermont will pay you to move to Vermont. Of course, there is a catch. You need to “work from home” (or from a co-working space) for an employer who is not based in Vermont. And the money has to help cover your costs of relocating to Vermont and/or of working “remote”. Put another way, Vermont wants to encourage people who “work from home” to move to Vermont. You can read the entire law here. As a non-lawyer, I found it surprisingly short and easy to read. There is also additional details in coverage from The New York Times and National Public Radio. Of course, if you prefer to work in an office, there are also employers in Vermont who are looking to hire. Everything from large corporations to scrappy startups, across a range of industries. 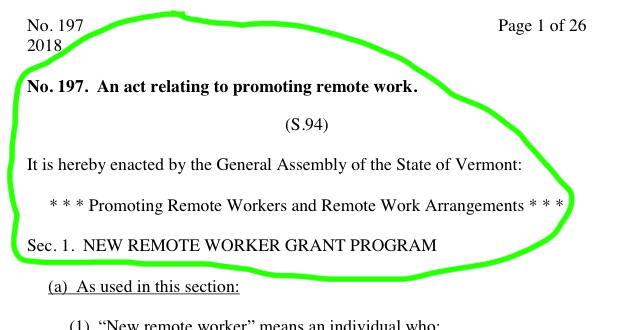 But the incentives in this law are specifically focused on people who “work from home” (or a co-working space) as part of a distributed team, working for an employer that is physically located outside of Vermont. This is the first US state law I know of providing job incentives to humans – not companies – and is a very exciting change in the social contract. If you could live anywhere and still have a meaningful job/career, where would you choose to live? There are many factors in deciding where to live. Everyone has different interests in their life. People who are enthusiastic surfers are unlikely to consider moving to Vermont. However, the skiing, snowboarding, mountain biking and hiking in Vermont are world-class. So too is the leaf-peeping. Housing is plentiful and great value. Crime is low. Schools are good and it has the highest number of universities per capita in the US. Overall, quality of life is good. Really good. Of the 50 states nationwide ranked by wallethub.com, Vermont ranked 4th best for raising a family and 5th best for quality of public schools. Oh, and if you do need an occasional trip to a big city office (say for client meetings or group gatherings or conferences), you are within 3-5 hours drive/bus/train of Boston, Connecticut, Manhattan(NYC) and Montreal. Too far for a daily commute, but otherwise very reasonable. Before you decide to relocate to Vermont, I recommend you first visit and explore. Not just as a tourist, but as someone thinking of moving there – as a potential new resident who cares about the reality of day-to-day life. To help with relocating decisions, Vermont has online sites which give details about the state. Vermont is also running free “Stay-to-Stay” events, where you visit Vermont for a long weekend to meet with locals who will help answer any/all of your relocation questions. They’ll help make sure you find your way around, introduce you to other local professionals and realtors, invite you to business networking events, arrange school/college tours, etc. The idea is to help answer any questions about housing, schools, healthcare and the other details of life that people care about when relocating. Once you know you want to move to Vermont, click here to read the rules and to apply. It is all intentionally quite straightforward and if you have any remaining questions, you can contact the organizers at remoteworker@vermont.gov. When running my own “distributed teams” manager bootcamps, I describe how vacant job postings are filled faster, simply by adding the words “remote welcome” in the job description. I’m excited to see Vermont saying “remote welcome” at a whole new level. It will be exciting to watch how this turns out. Last but not least: if you are reading this and do decide to relocate to Vermont, I’d love to hear from you. ps: Another interesting part of the new law is about co-working spaces and maker spaces. Vermont already has a bunch – see a partial list here – but this new bill provides funding to encourage creating even more maker spaces and co-working spaces with high speed internet. More on this in another post. Previous Previous post: “Distributed Teams as a Competitive Advantage” in Sydney!